Lots of couples find themselves planning two weddings – the one on Pinterest, and the one they can actually afford. But what if you could get that cool, Insta-worthy wedding without having to sell a kidney to pay for it? That’s the premise behind The Wedding Pop, a brand new service specialising in pop-up weddings and elopements that promises to give UK couples the luxe wedding of their dreams for an affordable price. Pop-up weddings have taken America by storm (all the hip New Yorkers are doing it), so we’re beyond excited that The Wedding Pop has chosen to launch first of all in Glasgow and Edinburgh. Scotland has never been so on-trend. Perfect for anyone who wants to get married at relatively short notice in Scotland, The Wedding Pop plans weekend weddings around 4-6 months in advance and takes care of all the details for you within a comprehensive package. What makes it different to a regular wedding planning service is that The Wedding Pop only collaborates with top-end wedding suppliers – aka the cooler-than-cool companies you’ve been lusting over who may be slightly out of your budget – and works in a unique way to give you their services for a fraction of their usual cost. Your package includes a ceremony space for up to 30 guests (there’s an option to add more if the venue allows), celebrant, drinks and canape reception, top industry photographer (who will give you 50 images of your day), a live musician, bouquets and buttonholes, a fully styled room on a pre-set theme by a leading design team, and a dedicated wedding planner, with prices starting from just £3,300 all in. The reason it can be offered at this price is simple: each pop-up wedding gets a two-hour time slot, and The Wedding Pop works with three slots a day, so you’re essentially splitting the cost with other couples to get the day of your dreams. “The Wedding Pop is for the 21st-century couple, for those who want a stylish, cool and chic day; who appreciate the quality of the top suppliers in the industry and lust after their products and services, but don’t have a huge budget to spend,” says founder Maria Ure. Oh, and it doesn’t end after your two-hour slot is over. Your package also includes a concierge service, where The Wedding Pop can help you plan the rest of your wedding day, organising add-ons such as private dining and recommending other suppliers to make your day extra special and completely personal to you. 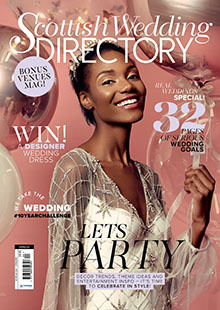 “This is not for couples who want the traditional wedding – there are many places in the industry these couples can go; but is a chic alternative to something like the registry office, for couples who want something quality, stylish, but affordable and makes the chic, luxury end of the market accessible for a more modest budget,” adds Maria. FANCY PLANNING YOUR OWN POP-UP WEDDING WITH THE WEDDING POP? The Wedding Pop is currently available in Glasgow and Edinburgh. Yay! and 3rd March at WEST on the Green, Glasgow (£3,300). To book one of these dates or get chatting to one of the lovely folk on The Wedding Pop team, drop them a line.